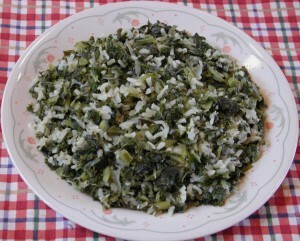 This collard greens kale rice recipe is relatively easy to prepare. It can be cooked in either a wok or in a microwave oven, and it can be made with either fresh or frozen collard greens and kale. This collard greens kale rice recipe is relatively easy to prepare. It can be cooked in either a wok or in a microwave oven, and it can be made with either fresh or frozen collard greens and kale. It will serve four or more people as a main meal. Leftover collard green kale rice can be stored in the refrigerator in the covered baking dish or other covered container for a few days, and it’s great when warmed up. When using fresh collard greens and kale, we begin by cutting off the stem ends and soaking the greens in a sink full of cold water. While the collard greens and kale are soaking, place the rice pot on the stovetop with 2 cups of water, and turn the heat up to high to bring the water to a boil. While the water is heating, wash and peel the onions and begin washing and cleaning the collard greens and kale, removing any bad spots. When the water in the rice pot begins to boil, add the rice, cover, reduce the heat to low, and simmer until the water is absorbed into the rice. Finish washing and cleaning the collard greens and kale, and coarsely shred the onions, collard greens and kale in a food processor, or dice the onions with a knife, and cut the collard greens and kale into bite-sized pieces. Place the shredded or cut collard greens, kale (or frozen collard greens and kale if you are using them) and onions in a covered microwaveable dish, or in a wok, add the mint, oregano, and parsley, mix well and cook until the collard greens and kale are tender and the onions are semi-translucent. When the rice and veggies are cooked, combine them together with the lemon juice and mix well. Allow the flavors to blend together for about 5 minutes, and reheat as necessary. Serve the collard greens kale rice and Enjoy! See our Recipes Table of Contents on our archival web site for all our vegan recipes.